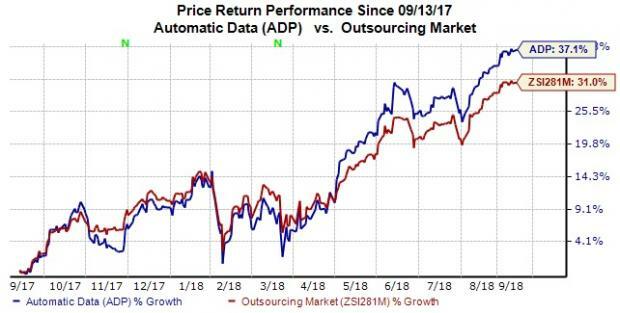 Shares of Automatic Data Processing, Inc. ADP have gained a massive 37.1% over the past year, outperforming the 31% rally of the industry it belongs to. We believe that the company has the ability to sustain this momentum, courtesy of strong business model, transformation initiatives, acquisitions and solid cash flow. ADP boasts a strong business model, high recurring revenues, good margins, robust client retention and low capital expenditure. The company continues to invest in its ongoing transformation and is in the process of expanding it through several broad-based initiatives. These initiatives are enabling the company to expand margins and improve innovation abilities. Moreover, ADP continues to pursue acquisitions that strategically fit its overall business mix and are easy to integrate over the long term. Recent acquisitions of WorkMarket, Global Cash Card and The Marcus Buckingham Company have strengthened ADP’s customer base and helped it expand operations in international markets. This apart, ADP has a strong cash generation capacity that not only helps it return value to shareholders but also pursue growth in areas that exhibit true potential. At the end of the last reported quarter, the company had cash and cash equivalents of $2.2 billion. Notably, ADP has a long-term (three to five years) expected earnings per share growth rate of 11.3% and a Growth Score of B. In the light of these positives, we believe that ADP should be retained by investors for now. The Zacks Rank #3 (Hold) carried by the stock seems to suggest the same. A few better-ranked stocks in the broader Business Services sector include Heidrick & Struggles International HSII, BG Staffing BGSF and Insperity NSP. While Heidrick & Struggles International sports a Zacks Rank #1 (Strong Buy), BG Staffing and Insperity carry a Zacks Rank #2 (Buy). You can see the complete list of today’s Zacks #1 Rank stocks here. The long-term expected EPS (three to five years) growth rate for Heidrick & Struggles International, BG Staffing and Insperity is 13.5%, 20% and 18%, respectively.